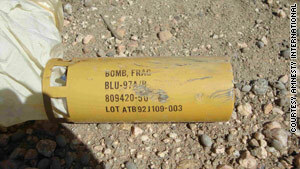 Amnesy International describes this as an unexploded bomblet that would have been carried by a cruise missile. (CNN) -- American missiles were used in an attack that killed 55 people, including 41 civilians, in southern Yemen, Amnesty International said Monday. The human rights organization released what it said were photographs of a U.S.-manufactured cruise missile used in the December attack in the community of al-Ma'jalah, and said authorities must be held accountable. "Based on the evidence provided by these photographs, the U.S. government must disclose what role it played in the al Ma'jalah attack, and all governments involved must show what steps they took to prevent unnecessary deaths and injuries," said Philip Luther, deputy director of the organization's Middle East and North Africa program. Asked about the report, Pentagon spokesman Bryan Whitman said, "I would refer you to the Yemeni government for any information on operations against al Qaeda in their country. That said, the Yemen government should be commended for dealing with the al Qaeda threat in their nation. Al Qaeda in the Arabian Peninsula threatens the stability of the region and poses an increasing threat to Yemenis and Americans. We strongly support actions against al Qaeda in the Arabian Peninsula and cooperate closely with Yemen and other countries on counterterrorism initiatives." The government of Yemen has not yet been reached for comment. Yemeni government officials had said the December 17, 2009, attack in southern Yemen targeted an al Qaeda training camp, according to Amnesty International. The attack killed 55 people, including 14 alleged members of the terrorist group, the organization said. Civilians killed included 14 women and 21 children, Amnesty International said. Amnesty International said the photos were provided to the organization by a confidential source. It said the organization had spent months checking their contents with specialists, but teams from Amnesty International had not yet been able to visit the site to verify the images. In December, senior U.S. officials told CNN U.S. special operations forces and intelligence agencies, and their Yemeni counterparts, were working to identify potential al Qaeda targets in Yemen. This was part of a new classified agreement with the Yemeni government that the two countries will work together and that the United States will remain publicly silent on its role in providing intelligence and weapons to conduct strikes, the officials said. Officially the United States has not said it conducted previous airstrikes in Yemen, but officials have privately said the Yemeni military could not have carried out the strikes on its own. Washington began eyeing the impoverished desert nation as a possible new haven for al Qaeda as early as 2001, after the invasion of Afghanistan triggered by the group's attacks on New York and Washington. It's the ancestral homeland of al Qaeda founder Osama bin Laden, whose followers bombed the destroyer USS Cole in a Yemeni port a year before the 9/11 attacks. In December the country became the target of more scrutiny after U.S. officials said the suspect in the Christmas Day attempt to blow up a Northwest Airlines flight over Detroit had trained at a camp in Yemen.